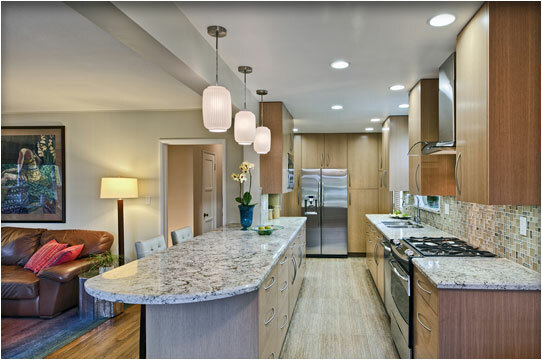 Latest Design Option 4-2, Gallery-Style Kitchen » Roger Perron Inc. In this view of the remodeled kitchen you can see that it is a galley-style kitchen, providing ample storage and counter space. The refrigerator is flanked by pantry cabinets. The open access to the family room makes for a spacious feeling in what would otherwise be a small kitchen. The backsplash is lined with glass mosaic tiles to complement the granite and other design elements.